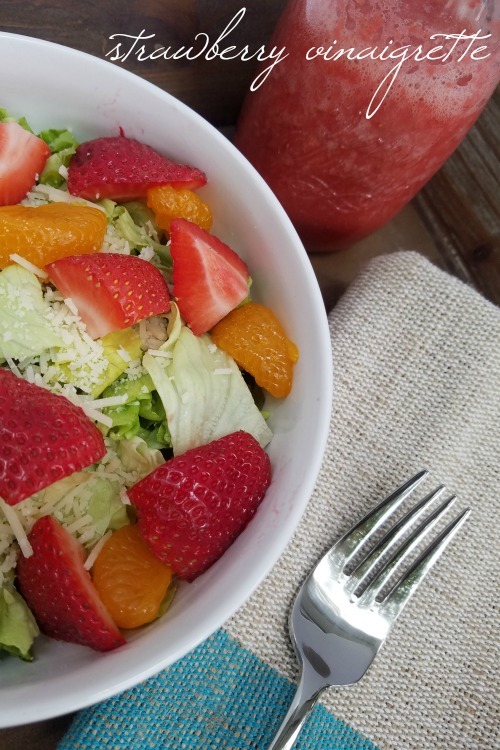 Homemade Strawberry Vinaigrette… it’s a taste of sunshine and summer in every bite of salad. 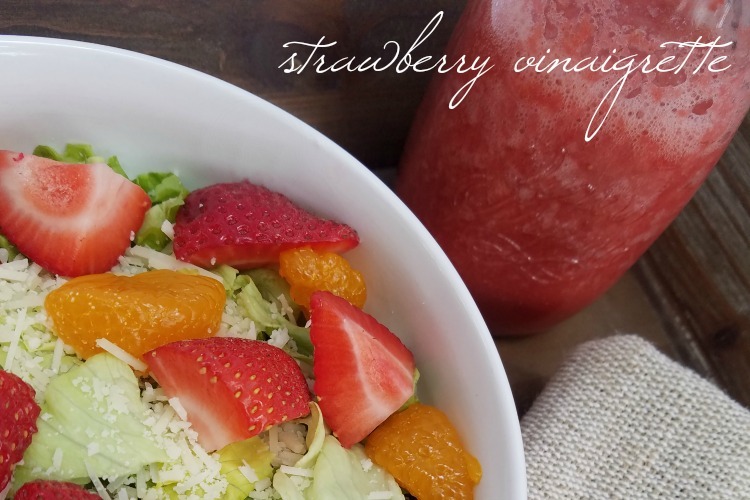 It’s the sweetness of berries with a little zing that ignites and excites your palate and perfectly dresses up even the simplest of salads. Honestly, this vinaigrette is amazing! And it’s no fat, low carb, low cal, gluten-free, and dairy-free so it fits into almost every eating plan! I have to confess, this isn’t a “true” vinaigrette. A typical vinaigrette is made of oil, vinegar, and seasonings. Our vinaigrette skips the oil. But trust me, you won’t miss it. And neither will your waistline. You can modify the ingredients based on what you have in your cabinet without sacrificing any the deliciousness of the dressing. The recipe below calls for Red Wine Vinegar as the wet ingredient. However, you can substitute white balsamic vinegar or any other vinegar-like white wine or champagne in it’s place. The recipe calls for Stevia. But if Stevia isn’t your thing, sugar or any sugar substitute will work. Just realize that altering the type of sugar may alter the calories. You can even take out the garlic or cut down on it. A family member with dietary restrictions came over for lunch. She has had to cut out garlic, onions, and the like. So to accommodate her diet, I made the dressing sans garlic and it was still delicious! AND… it only take about 5 minutes to make! Usually when I think of homemade sauces, I think time consuming. This vinaigrette proves that theory wrong. It’s so quick and simple that there is no excuse not to make something so healthy and delicious! You could mash up the ingredients by hand, but I’ve affiliate linked to my super speedy secret. 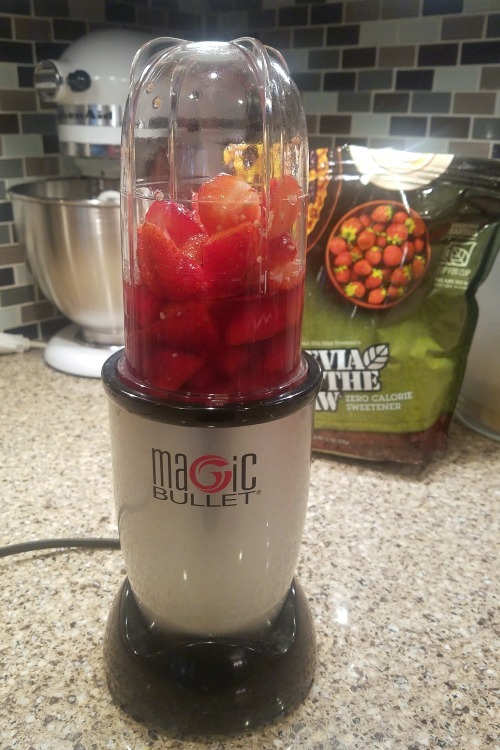 Here it is… I just combine all the ingredients into my Magic Bullet and within seconds it’s good to go! You could also use an immersion blender, food processor, or Ninja Professional Blender! The vinaigrette can be used as a salad dressing (and trust me, from someone who usually loves her salad coated, a little goes a long way!). It can also be used as a dressing for cucumber salad or as a condiment for a lunchmeat and veggie wrap. 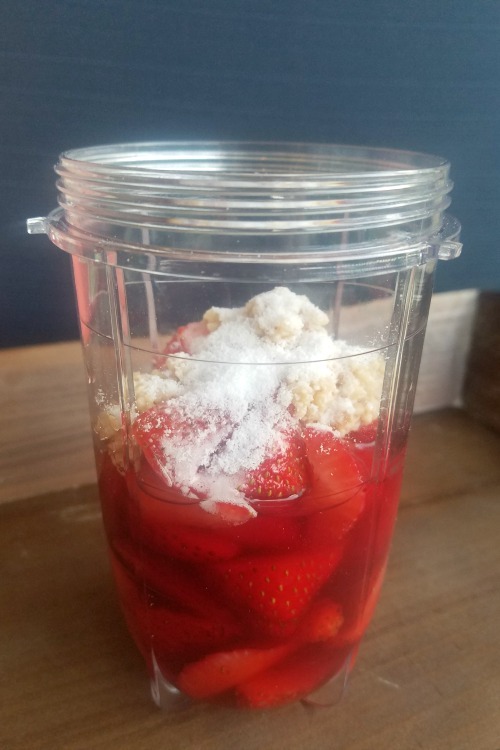 Depending on how sweet your strawberries are, you may want to add a little more Stevia. Try the vinaigrette first though before adding more. Happy healthy eating, friends! Hope you loved it! I know your body will!